I was sent the Tommyguns Climate Control Styling Spray to review about a week ago and to be honest I wasn’t expecting anything spectacular. 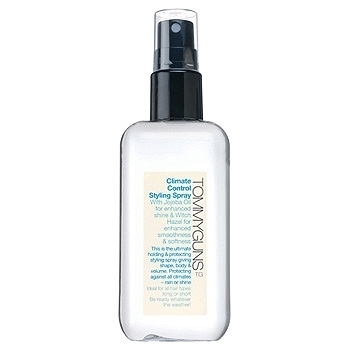 The spray claims to be ‘the ultimate holding and protecting stying spray giving shape, body and volume. Protecting against all climates – rain or shine’. I had serious doubts that a single product could manage to do all of those things with a simple spritz. Having used the spray daily since I received it, I am converted. I am converted for two main reasons: firstly the luscious smell and secondly how amazingly soft and smooth my hair is. The spray contains jojoba oil (‘for enhanced shine’) and I think this is what smells so delicious. I absolutely adore the scent and probably apply a little more product than I should, just to smell it. It also contains witch hazel for enhanced smoothness and softness – I can vouch for this as I keep running my fingers through my hair. It feels sooo amazingly silky from root to tip. This doesn’t really add that much volume to my naturally flat hair, but it doesn’t leave it feeling as ‘blah’ and lifeless as usual, so add a bit of hairspray and I’m a happy girl. Packaging wise, Tommyguns is simple but stylish and I would be happy to have this on show. The packaging also looks far more expensive than the price point of £5.99 for 150ml. As always, the burning question: would I repurchase? Yes, wholeheartedly YES. I love this product and will definitely buy my own bottle when the sample I was sent runs out. This product was sent to me for the purposes of a review. I did NOT buy this product with my own money. All reviews are honest and impartial regardless of the source. this sounds lovely…. I love both scents of witch-hazel and jojoba, and for £5.99, bargain!